The Rokka is a fishing boat, a see-saw and a den. Turned upside down, it is a table and two chairs for eating or drawing, or a trip-trap bridge for some rudimentary stair-training. Made from quality birch plywood, it withstands the hardest wear. The Rokka Cornish fishing boat is the basic unit of the all-in-one Rokka. 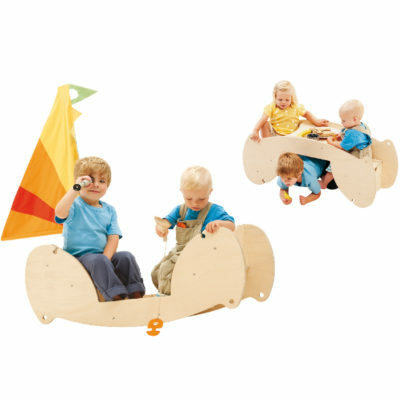 Children can enjoy wild adventures in stormy seas with the see-saw design of the boat and its colourful sail and cushions. Or they can row ashore with giant wooden spoon paddles. Then, when they are ready for a break, the Rokka Cornish fishing boat can be turned upside down to make a playtable with two padded seats on either side. There they can have a meal or draw or read a book. Underneath the table they find a tunnel and a bridge on top. The Rokka features enough circles and strategically placed holes so that it may be transformed very simply into many exciting play themes using giant wooden spoons and bright orange fish fasteners supplied. The sturdy construction of the Rokka Cornish fishing boat from quality birch plywood means that children can clamber about it in safety and practice jumping, climbing stairs and balancing. Accessories available to further open up the world to imagination play with a kitchen set and puppet theatre.